Jayarava's Raves: Everything changes, but so what? Everything changes, but so what? πάντα χωρεῖ καὶ οὐδὲν μένει. Heraclitus quoted in Plato. Cratylus. 402a. Perseus Digital Library. Nothing endures but change. 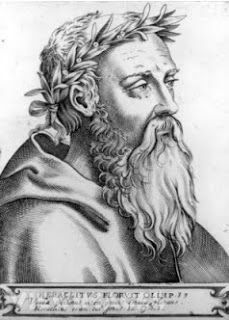 Heraclitus (540 BC – 480 BC), from Diogenes Laertius, Lives of Eminent Philosophers. What can we take on trust in this uncertain life? Happiness, greatness, pride—nothing is secure, nothing keeps. Euripides, Hecuba. ὁ κόσμος ἀλλοίωσις, ὁ βίος ὑπόληψις. The universe is change; our life is what our thoughts make it. Marcus Aurelius Antoninus, Meditations, V, 3. A similar kind of distinction is made in Buddhism. Our views (dṛṣṭi) about experience are expressed as opinions on the world, and on reality. But with insight and wisdom we begin to see that what we comment on is merely perception which is subject to change even when the object being perceived does not change. However it is possible to see experience just as it is (yathābhūta) and this kind of insight has certain characteristics which do not change. The knowledge gained is called prajñā. I would see this in terms of knowledge about the underlying dynamics and processes of perception - it has no object as such, hence it is without condition (asaṃskṛta). And I see no hint that Sedley is in any way familiar with, let alone influenced by, Buddhism in his reading of Plato. However, modern presentations of Buddhism are influenced by Neoplatonism. I think this is sufficient to establish that "everything changes" is not an observation unique to Buddhism. There are two possibilities. Either the statement tells us that the Greeks were on the same wavelength as the Buddha; or the statements are both equally banal. And I suggest it is the latter. I don't think that observation that everything changes is very profound; or that the Greeks were awakened in the Buddhists sense; or that "everything changes" is what the Buddha was on about. Hopefully this opinion doesn't come as a surprise. I've written a number of times that I do not think that paṭicca-samuppāda was intended to be a theory of everything. This is argued at length in my commentary on the Kaccānagotta Sutta, and summarised in my blog post: A General Theory of Conditionality? The theory paṭicca-samuppāda was intended to explain the arising of experience, and guide us towards insights into why we suffer, with suffering distinguished from painful sensations. It might be argued that this is an attempt to discover 'the original Buddhism' which I myself have described as folly, and criticised others for. However I think there are good doctrinal and methodological reasons for adopting this approach and these are set out in many previous blog posts, and longer essays. I've gathered many quotes from Westerners who, as far as I know, were not aware of or influenced by Buddhism. All things change, nothing is extinguished. There is nothing in the whole world which is permanent. Everything flows onward; all things are brought into being with a changing nature; the ages themselves glide by in constant movement. Ovid (BC 43-AD 18) Roman poet. In human life there is constant change of fortune; and it is unreasonable to expect an exemption from the common fate. Life itself decays, and all things are daily changing. Plutarch (46-120) Greek essayist, and biographer. Today is not yesterday: we ourselves change; how can our works and thoughts, if they are always to be the fittest, continue always the same? Change, indeed is painful; yet ever needful; and if memory have its force and worth, so also has hope. - Thomas Carlyle (1795-1881) British historian and essayist. Change doth unknit the tranquil strength of men. Matthew Arnold, A Question. Johann Wolfgang Von Goethe (1749-1832) German poet, novelist and dramatist. Edmund Burke (1729-1797) British political writer. Change is inevitable. Change is constant. Benjamin Disraeli (1804-1881) British politician and author. "Everything changes". Amongst Buddhists "everything changes" has become a cliché. But, so what? Awareness of it should, and does affect the way we choose to live, however I do not think it was the radical insight seen by the Buddha. I have tried to show in my essay on the Kaccānagotta Sutta that the idea of that everything changes was, from the Buddha's point of view, demonstrably false. With only his bare senses and mind he couldn't have imagined that gem stones for example changed imperceptibly over millions of years: they simply did not change. However our experience of everything is always changing, even when presented with an apparently unchanging object, and here we are closer to the mark.